During the Middle Ages, cultivating the swampy land beyond the walls of the monastery was vital for the survival of the community of monks at Walkenried. 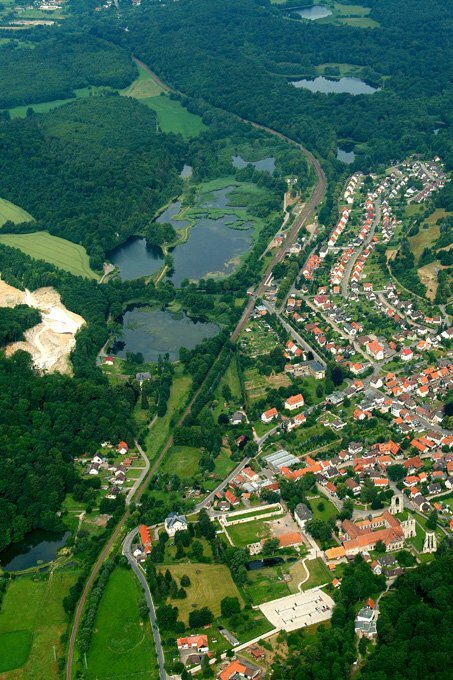 In a relatively small area, the monks created a system of 16 fish-ponds – in fact there is evidence of about 50 large and small ponds in total around Walkenried. Fish was one of the monks’ staple foods and also an important trading product. Historically, the ponds were probably populated with crucian carp and pike. The monks shaped the original natural environment into a man-made landscape. Today the Cistercian pond landscape is a nature reserve, a wonderful place to relax and experience nature just three hundred metres from the Cistercian Museum Walkenried Monastery. With its still clearly visible dams, overflow ditches and diversion ditches, the historic pond landscape has been preserved as a monument of mediaeval technology. The old systems to control the water level and drain the ponds using plug systems and so-called "pond monks", still function today. They were especially important as the Walkenried ponds are purely rain-fed and therefore react particularly sensitively. Already in the 1930s, the pond landscape was designated for protection as the Priorteich/Sachsenstein Nature Reserve. Now as then, it requires constant maintenance to keep the ponds clear of reeds and to prevent them from silting up. Today the Walkenried Angling Club helps with this task.